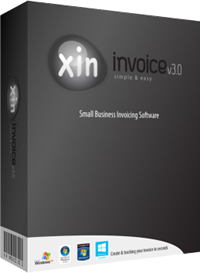 Xin Invoice software - handy and cost effective: Can Xin Invoice support multiple users? We need multi-user usage, can you please advise whether it can be accessed by multi-user through network? No. Xin Invoice 3.0 is a standalone program that does not support multiple users by network. If you wish to have a network version invoice software, please download Xin Inventory 2.0 from http://www.xininventory.com to try the network version invoice software. For Xin Invoice 3.0, there is some feedback from our existing users that they manage to make it network accessible by using Dropbox. Here are some suggestion from our users who use Dropbox. After installation, create a desktop shortcut pointing to the new install..
On all other networked (via DropBox) computers, simply access the DropBox folder and create another desktop shortcut. You can download a program at http://schinagl.priv.at/nt/hardlinkshellext/hardlinkshellext.html what this does is create a constant redirection. So you copy all the Xin attachment folders and company database to the dropbox and then create a redirect in the Xin installation folder pointing it to the dropbox folder location. Although we do not stop our users from doing this, Xin Cube does not provide further support on any issue arises due to using Xin Invoice in Dropbox.